More than seven million people visit the Outer Banks of North Carolina every year, and they all fall in love with its coastal Southern cuisine. 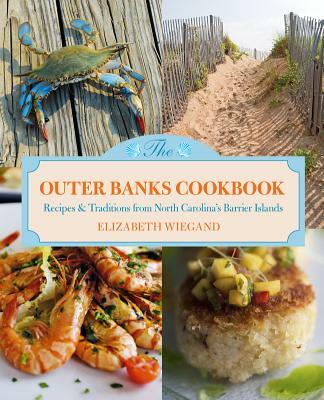 The Outer Banks Cookbook is a true celebration of the many flavors of North Carolina's coastal communities with an emphasis on local food and products. The second edition features beautiful full-color photographs and more than 100 easy-to-follow recipes for appetizers, chowders, entrees, desserts, cocktails, and more. Included are family recipes, traditional dishes from locals, and specialties from the many restaurants dotting the Outer Banks. Elizabeth Wiegand is a North Carolina native and author of The New Blue Ridge Cookbook. Her articles on food, travel, and design have appeared in the Washington Post, Southern Living, Our State, and Edible Piedmont. She maintains a blog at CarolinaFoodie.blogspot.com, and is a member of the Southern Foodways Alliance. She has been cooking, fishing, sailing and searching for good food along NC's coast for over four decades. Wiegand, a farmer's daughter, grew up landlocked on a farm that's been in her family since before the Civil War, and learned Southern cooking and foodways under her grandmother's tutelage. She's traveled and eaten her way though France, the Caribbean, Central America, and all over the United States, and shares her love of cooking, collecting food stories and spreading the gospel of eating local by teaching, speaking, and television cooking demo's. She lives in Raleigh, NC.